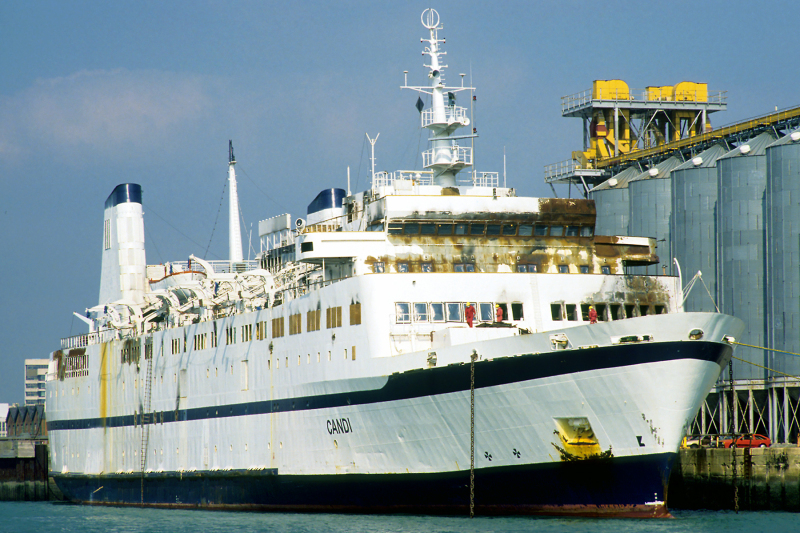 Candi lying Southampton in September 1990. As Scandinavian Star, she had been the subject of an arson attack which claimed 158 lives, including that of the known arsonist. Built by Dubigeon-Normandie S.A. as the Massalia in 1971, she later traded as Stena Baltica and Island Fiesta before taking the name Scandinavian Star in 1990. On 7th April 1990, the arsonist struck whilst the vessel was on a voyage from Oslo to Frederikshavn. The damaged vessel was first towed to Lysekil, then to Hull in August 1990 for work to be carried out by Humber Ship Repairers. But they went bankrupt and the vessel was towed to Southampton by Maersk Blazer, for work to be carried out by CLC Marine Services. Repaired and refurbished she was renamed Regal Voyager in 1994 and was put into service again, but suffered main engine damage in 1997. Again repaired, she traded until 2004, when she was renamed Regal V, for the voyage to Alang for breaking. The findings draw horrible conclusions. This photo has been shown 5,176 times since it was added to the site.